The Kosma Double Wall Wine Cooler is an ideal addition for wedding parties, anniversary bash and backyard barbecues. Simply fill the wine cooler with ice cubes and keep a single standard sized bottle of liquor or wine within the chiller, and see for yourself how well the wine bottle cools up. The Kosma Wine Cooler also looks good at the table top in the dining area, a perfect accent to kitchen counter tops. 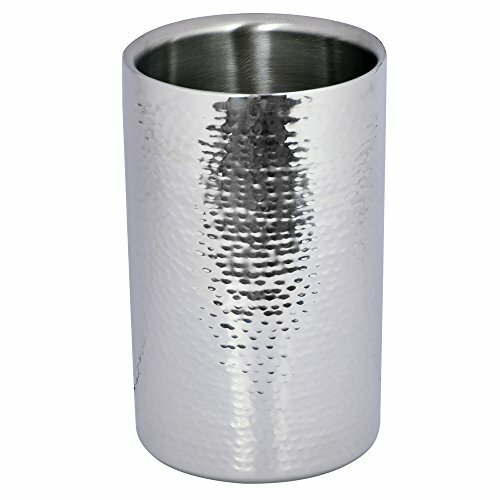 Crafted from high lustrous and durable stainless steel, this Wine Cooler from Kosma features a hammered finish. The best highlight of this wine cooler is the double wall insulation, which keeps the ice cooler for longer durations of time, and prevents condensation from occurring outside. Why buy Designer Wine Coolers from Kosma?